My reddish, reactive skin (see Sunday’s post) pushed me towards products I knew wouldn’t cause the same thing, When I pulled this out and realised it hadn’t been on the blog, I thought I would right that wrong. 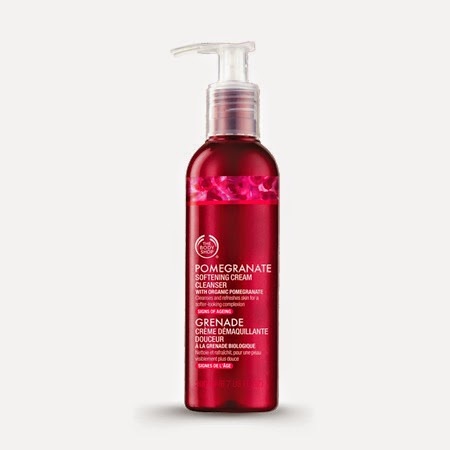 Although the Pomegranate range is aimed at an older skin or to put it officially, it *addresses the signs of ageing*, the Softening Cleanser is one of those products where you don’t have to follow that to the letter. Aqua (Solvent/Diluent), Isododecane (Solvent), Glycerin (Humectant), Bertholletia Excelsa Seed Oil (Emollient), Glycine Soja Oil (Emollient/Skin Conditioner), Sucrose Cocoate (Emollient), Betaine (Hair Conditioning Agent), Caprylyl Glycol (Skin Conditioning Agent), Phenoxyethanol (Preservative), Hydroxyethyl Acrylate/Sodium Acryloyldimethyl Taurate Copolymer (Emulsion Stabiliser), Acrylates/C10-30 Alkyl Acrylate Crosspolymer (Stabiliser/Viscosity Modifier), Parfum (Fragrance), Squalane (Hair & Skin Conditioning Agent), Bisabolol (Skin Soothing Agent), Creatine (Skin-Conditioning Agent), Punica Granatum Seed Oil (Skin Conditioning Agent – Emollient), Butylene Glycol (Humectant), p-Anisic Acid (pH Modifier), Sodium Hydroxide (pH Adjuster), Carbomer (Stabiliser/Viscosity Modifier), Punica Granatum Extract (Natural Additive), Polysorbate 60 (Surfactant), Disodium EDTA (Chelating Agent), Pyrus Malus Fruit Extract (Natural Additive), Hydroxycitronellal (Fragrance Ingredient), Pentylene Glycol (Solvent), Secale Cereale Seed Extract (Natural Extract), Ursolic Acid (Fragrance Ingredient). I would say that most skins are able to use this cleanser. If you were particularly spotty it might be better than a lot of milk options that tend to always include shea butter at quite a high %. Anyone over 30 or with particularly dry skin should check it out. Removes makeup with ease but I would use another separate eye makeup remover if you wear heavy duty EMU. It does contain fragrance but my skin is perfectly fine with it. Apply a couple of pumps to your palm on a dry hand, do the therapist ‘swipe’ (see previous posts – maybe I should do an Instagram 15 second video? ), apply directly to dry skin and massage in. Remove with a warm washcloth (flannel!) and repeat if necessary. I tend to use this either as a morning cleanse or a quick 2nd cleanse in the evening. *Sorry about the stock picture. I can either write the review or take nice pictures, I can’t always do both. Imagine it on a blurred background surrounded by fairy lights and candles. There you go! Previous Post New appearance date – Belfast!